Illegal Civilization’s documentary features appearances from Kanye West, Lil Wayne, A$AP Rocky, Pharrell, and more. Illegal Civilization has shared the trailer for an upcoming documentary about the making of Tyler, The Creator's 2015 album, Cherry Bomb. The documentary features appearances from Kanye West, Lil Wayne, A$AP Rocky, Pharrell, Schoolboy Q, the Internet’s Syd, Kali Uchis, and more. 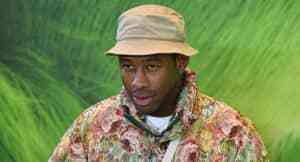 The trailer features plenty of silly Tyler moments, but also shows him working on the album and directing an orchestra. Illegal Civilization will be screening a 10-minute preview of the documentary Tyler's Camp Flog Gnaw festival this weekend. The documentary will be released in full on DVD in January. Watch the trailer for the Cherry Bomb documentary above.